Welcome to 123 4th Apartment Homes! Located in the heart of historic downtown Olympia, 123 – 4th offers exciting new apartment homes showcasing affordable modern and green features for a healthy, sustainable lifestyle. Experience the character of this notable capitol neighborhood complete with a host of nearby local shops, restaurants and parks. Hop on the bus, walk or ride your bike to the Olympia Farmer’s Market. Pick from a range of unit styles and sizes to find the perfect match, and with the building’s green design, you can enjoy greener living too. Construction is underway with tenant move-ins starting in Spring of 2016. 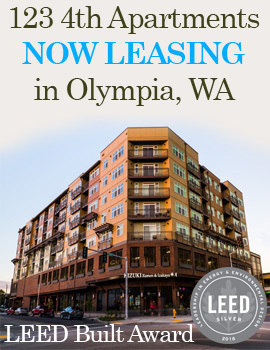 Sign up here (hyperlink) to receive project updates and the opportunity to pre-lease one of our condominium-grade apartment homes in the heart of old Olympia!